Additional tour dates in Germany in Autumn! 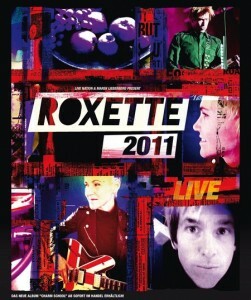 Live Nation has sent out the first dates of the additional dates which will be added to the Roxette World Tour 2011. The dates are, so far, for Germany and Spain (already known) only. Information about ticket sales in Germany is still not available. In addition, apparently Live Nation Spain has cancelled the Golden Ring tickets which were announced last week, so currently only the normal tickets (49 EUR) are listed on the website. More dates to come, hopefully in other countries and Stockholm too! For the complete tour agenda so far, visit our World Tour 2011 page! Update: Tickets for Germany will go on sale this Friday, March 18 at 9 in the morning. A short note about releases: The interest in the countries where “Charm School” hasn’t been released yet is very high. However, the album won’t contain the same track list in all countries. For example, China has forbidden Roxette to release “Sleeping In My Car” due to the sexual content. Therefore the live version of this song, which is included in the Deluxe version of “Charm School”, will be excluded. As it appears 2 more concerts in Germany are close to sold out after Berlin. Cologne is already sold out at both big ticket vendors, while the availability for Leipzig goes on/off at getgo.de and eventim.de. According to Roxette’s homepage, 53,000 of 60,000 tickets in Germany (excl. the Audi gigs, as it appears) are sold. The Hessentagsarena in Oberursel/Frankfurt has capacity for up to 30,000 visitors. Have a look at our World Tour 2011 page for the complete tour plan so far. Thanks to Rene for the Cologne tip! 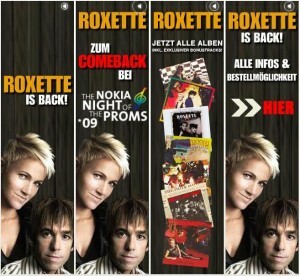 Roxette’s “official German website” got just launched on www.roxette.de. The site basically features the same content as www.emimusic.de/roxette – where the domain was previously forwarded to – but is styled in line with the Charm School artwork. It embeds content from Roxette’s official Facebook page and runs a contest to win signed “She’s Got Nothing On (But The Radio)” singles. EMI used www.roxette.de already in the past to launch special sites for the “Room Service” and “Hits!” releases. After 20 years Roxette will finally take part at the German TV show “Wetten, dass..?”. On February 12th, Roxette will perform a Greatest Hits medley at the show which will be broadcast from Halle. The show is on German channel ZDF and the biggest TV show in German television – around 8-10 million people usually watch the programme. Unfortunately, tickets for this one show are already sold out. UPDATE, 24th January: A few minutes ago, EMI Germany confirmed that Roxette will play a medley including “She’s got nothing on (but the radio)”. UPDATE, 31th January: On Friday EMI revealed that Roxette play a medley of “The Look” and “It Must Have Been Love” along with “She’s Got Nothing On (But the Radio)”. Thanks mr jefferson! According to several sources, the ticket sale for the German shows starts on this Saturday, 6 am. Until now the shows are not listed at Germany’s biggest ticket site, Eventim.de. According to Swedish sources the sale for the Göteborg show starts on Monday and a ticket costs 450 SEK. Livenation.se has a note on their site telling about a Presale of special tickets starting tomorrow already. If you have any further information about tickets, sales, prices and more – let us know. According to Musikindustrin‘s journalist Lars Nylin Roxette will play in Germany in December. In the article about Sundsvall concert he mentions Russia and Germany as the exemples of forthcoming Roxette shows. Time will tell if it is true. Per says that he doesn’t know anything about any German gigs. So here they move on German roads. 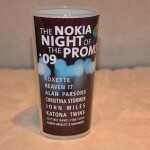 “The Night of the Proms” tour turns its name into “The Nokia Night of the Proms” thanks to the main sponsor of this event in Germany. 20 more shows to go! Will there be surprises on the part of Roxette? Will WICF stay in the first part of show? Will WICF stay in the show at all or will it be replaced with another song (as suggested of a NotP-forum)? Which classical piece will be replaced by “Le Carnaval Romain”? as this piece is on the CD, but wasn’t played in Antwerp, Arnhem or Rotterdam. Will Swedish Rhapsody leave the playlist, taking WICF along (as suggested of a NotP-forum)? Will a “new” Roxette-song enter the playlist? Church of your heart to replace WICF? Questions, questions, questions… to be answered next Friday in Hamburg! NOTP Germany: Drink and help! NOTP Germany presents the fan cup for the upcoming proms season. When you order a drink at the German tourdates (except Frankfurt) you get this cup against 2 € pledge. If you like to keep it as a souvenir the profit goes to the Nordoff Robbins music therapy foundation. In Frankfurt you can buy it at the merchandising shop. EMI Germany promotes Roxette 2009 remasters as well as “Night of the Proms” tour on its website. You can see there a banner with the informations regarding NOTP and 2009 discography. Germany, Austria and Switzerland release “Gessle over Europe” on November 6. According to EMI Germany, EMI Austria and EMI Switzerland, Per Gessle’s latest live album “Gessle over Europe” will be released on November 6 in these territories. Visit this websites to get to know where you can order the album. 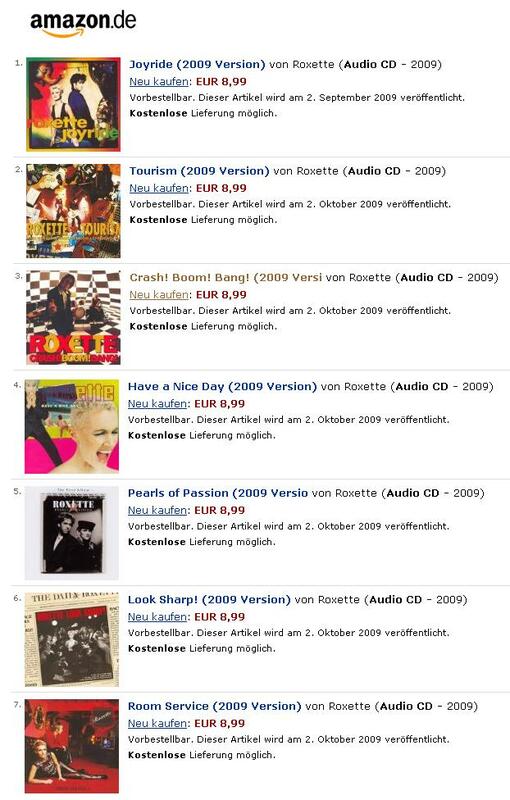 Amazon.de has added 7 Roxette albums to its list. Each album costs 8,99 euro. Thanks to mjzm @ RoxForum.